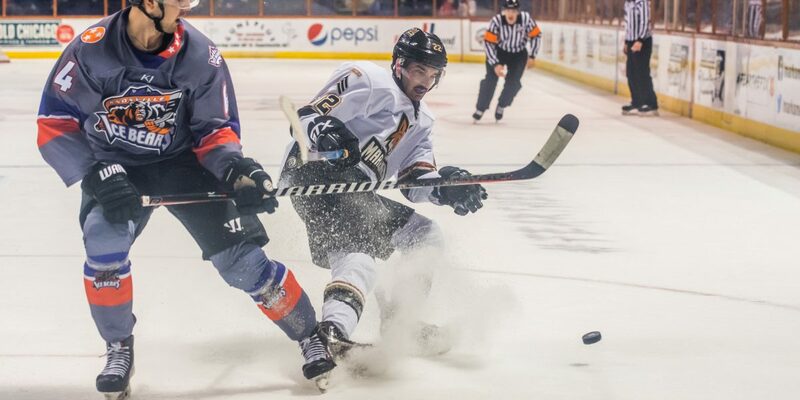 KNOXVILLE, TN – Looking for revenge after a end-to-end win for the Ice Bears the night prior, the Marksmen needed finish the series in Knoxville on a mission. Looking for a win to be back in a tie for fifth place in the standings with a three game series against an eighth place Pensacola team. With Nathan Perry starting in net, Fayetteville’s chances looked good and they kept looking good early in the game. The game started off from jump, as Nolan Sheeran and Spencer Metcalfe dropped the gloves only seven seconds into the contest. The game slowed down until the 11 minute mark. Newly-reacquired forward David Mazurek found the net for the first time since he got back to Fayetteville, as Taylor McCloy dished him a perfect feed. The Marksmen lead early, but weren’t done yet in the opening period of play. Six minutes after the first goal, Taylor Pryce got in on the scoring. Off of a faceoff win in the left circle of the offensive end, Pryce shot the puck from no-man’s land, and flipped it past the shoulder of Hayden Stewart, giving the Marksmen a 2-0 lead going into the dressing room after one. Period two was a flip of the script for the Ice Bears, after a dismal first period without a score they got off to a hot start. Five minutes into the period, the previous night’s game-winner Anthony McVeigh found the net, shortening the Marksmen lead to one. Knoxville opened the second period on fire, out shooting the Marksmen 11-1 in the opening portion of the period and it really paid off. Knoxville scored the equalizer just under three minutes after their opening goal, as Stefan Brucato sent one past a downed Nathan Perry, evening the game at two. Things were a bit more challenging for the Marksmen after the second period, as starting goalie Nathan Perry had gotten a bit roughed up, and wasn’t sure whether or not he should finish. After talking it over with the coaches and Dillon Kelley, Perry decided himself to sit out the closing period, not wanting his stinger to put the game at risk. The Marksmen looked to Kelley to finish off the game, attempting to keep the Knoxville tally at two. No easy feat coming into a tight game cold in the third, but DK was ready to rock. Kelley would surrender his only goal of the night on the second shot he saw, as Knoxville would find their first lead of the night from Roberts Locans, again. The lead wouldn’t last, as to Fayetteville’s relief came a goal of their own. Darren McCormick, who was playing hungry all weekend, scored an unassisted goal to knot the game up at three. With momentum, and a multitude of Knoxville penalties, Fayetteville looked to end it in regulation. Only being able to muster two shots on their long power play, the Marksmen got a penalty of their own. They successfully killed off the Knoxville power play, their third successful penalty kill of the night all while not allowing a power play goal. The Marksmen didn’t fare any better with the man-advantage, as they went 0-2 on the night with a power play. A few more shots to no avail sent the contest into an extra period. The Marksmen looked to improve on their 4-2 overtime record on the season. The extra period was quick-and-effective to say the least for the Marksmen, as the first and only shot of the extra frame was the game winning goal for Fayetteville. Darren McCormick raced around the left wing, pulled Stewart out of position, and wrapped around behind the net for his second-mark of the night, and another overtime winner for the sensational scorer – his 16th goal of the season overall. The win improves Fayetteville’s record to 19-14-4, tied for fifth in the league. Dillon Kelley is awarded the win after coming in relief for Nathan Perry in the third. Kelley’s record now sits at 12-9-1-1. This was the final meeting of the season between the two teams, as Fayetteville would finish 4-3-1. Fayetteville travels to Pensacola next week for three games against the high-flying Ice Flyers, looking to gain some ground in the SPHL standings.